The mission of CCAR is to provide consistent and compliant Safety and HazMat training, as well as education and environmental best practices for the global motor vehicle industry. CCAR’s vision is one of a workplace with fully trained automotive professionals, focusing on their craft, enhancing their overall business and living Safe. Clean. Green. The vision of CCAR is to ensure all automotive professionals are healthy and safe. Our extensive amount of resources provides you with the most relevant, up-to-date information about and impacting the automotive industry. Even handling a low level of hazardous materials can be dangerous. If you’re not properly trained to pack, mark, label, ship, work with, or transport hazardous materials, you could be putting yourself and your employees at risk for injury, illness, and heavy fines and penalties. Violating the federal DOT hazardous materials transportation laws is quite serious. CCAR continually reviews, revises, and updates State Contact Lists. 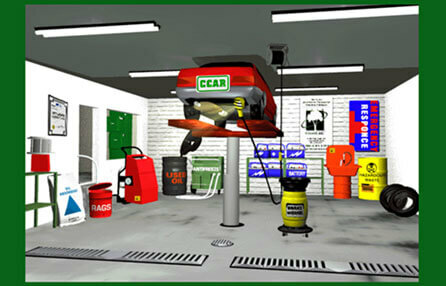 Our Virtual Shop is a graphic representation of a service and repair facility. Explore the different rooms and see what areas require environmental and safety considerations. For those who handle hazardous materials, having the right training is crucial to staying safe and healthy. At the request of the North American Automotive HazMat Action Committee (aka NAAHAC), a group of regulatory compliance specialists representing the major automotive manufacturers in North America, CCAR helped develop an e-learning program, HazmatU. HazmatU provides important automotive hazmat training and best practice information to automotive dealers so all shop employees can remain healthy, safe, and in compliance with the U.S. Department of Transportation (DOT) training requirements. CCAR staff participates in conferences that help keep us connected with our core customer base. For example, we have regularly attended the National Institute for Automotive Service Excellence Conference(s) [aka ASE], meetings of the Automotive Maintenance and Repair Association [AMRA/MAP], meetings held by the North American Automotive Hazmat Action Committee [NAAHAC], the annual North American Dealers Association meeting [NADA], and the annual meeting of the Automotive Training Managers Council [ATMC]. By attending these conferences and meetings CCAR stays current with the issues that affect and impact our constituents. We then research issues further and develop communications and training content to help keep our clientele aware and in compliance. 1. Why do shops and schools need CCAR products such as HazmatU anyway? To stay compliant. This means to stay legal. To do what the law says must be done. To do the right thing for the school or company they own or work for. This is a personal commitment much like the defense of our country. All should feel the need to take care of our environment and each other. To promote the right standards to others. CCAR® sees it as not only okay, but important that schools or businesses who participate promote themselves and lead the way as safe places to go, places that also deeply care about the environment. Promotion of the right things adds to the professionalism of the automotive industry. 2. Why is Safety training so important for schools? Schools must comply like any business. The EPA and OSHA say so. Most schools are not kept up to the minute on changing laws and rules. Actually businesses may receive the information before schools do. CCAR can provide the latest compliance information on Safety best practices for schools. Lastly, isn’t it important for the automotive industry to reduce the risk of violations and injuries which are most common in younger entry level employees? CCAR knows it is and by providing Safety best practices actually helps reduce insurance claims, human suffering and prevent pollution by those most apt to be involved. 3. Legally what does a shop have to do to stay in compliance with safety and environmental laws? The number one thing a shop has to do is to have a plan. You cannot wait until you have an environmental violation, injury, or crisis, such as a fire, and then try and come up with a plan. The largest number of violations has to do with not having a plan and not keeping paperwork complete. CCAR's online training shows you how to set up a written plan AND train all your people on the majority of day to day safety risks that are specific to your industry. 1. Why do shops and schools need CCAR®'s products such as AutoEHS anyway? 2. Why is Safety Training so important for schools? Schools must comply like any business. The EPA and OSHA say so. Most schools are not kept up to the minute on changing laws and rules. Actually businesses may receive the information before schools do. CCAR can provide the latest compliance information on Safety issues for schools. Lastly, isn’t it important for the automotive industry to reduce the risk of violations and injuries which are most common in younger entry level employees? CCAR knows it is and by providing training to sponsored schools actually helps reduce insurance claims, human suffering and prevent pollution by those most apt to be involved. The number one thing a shop has to do is to have a plan. You cannot wait until you have an environmental violation, injury, or crisis, such as a fire, and then try and come up with a plan. The largest number of violations has to do with not having a plan and not keeping paperwork complete. AutoEHS online training shows you how to set up a written plan AND train all your people on the majority of day to day safety risks that are specific to your industry. 4. I cannot get logged into the training. What's wrong? The most common reason is entering the login information incorrectly. If you are sure you typed it correctly, call CCAR - HazmatU at 888-476-5465 for assistance. 5. How current is CCAR's safety information? CCAR has staff who carefully watch federal laws on a regular basis, have contact with all 50 states and communicate with our liaisons at the EPA. The information on our site changes almost daily as laws and information change. CCAR is a non-profit organization dedicated to preventing pollution and improving safety in the automotive industry. CCAR was developed with the help of the United States EPA to increase knowledge on environmental issues within the automotive industry. 7. Is the AutoEHS Training available to automotive schools? Yes, all of CCAR’s online training is available at a special rate to approved automotive career/technical schools. If you want to sign up your school right now, call us toll-free at 888-476-5465. 8. Who else is using AutoEHS? CCAR helped to develop the industry standard of awareness in environmental and safety issues for automotive repair across the U.S. More than 6,000 repair facilities (including dealers and independent shops) and schools across the country have accessed CCAR training courses since being introduced in 2002. AutoEHS courses are offered in all 50 states, as well as in Canada. Service management – they may oversee hazmat employee operations and may sign for hazmat shipments with the disposal of their facilities wastes. The first five categories are generally referred to as "hazmat employee" training. Hazmat employee training must be updated any time DOT issues any new or revised rule applicable to the duties of a particular employee [49 CFR 172.702(b)]. The training must be completed by each employee "prior to performance of a function affected by the new or revised rule" [61 FR 27169, May 30, 1996]. Hazmat employee training must be repeated in its entirety (not just updated or refreshed) at least every three years [49 CFR 172.704(c)(2)]. This "recurrent" training must include testing and formal recordkeeping. If an employee has not been re-trained within the past three years, that employee cannot perform any hazmat employee functions until trained. Shipmate, our partner for this course, makes these materials available for purchase. Contact Shipmate at 1-310-370-3600. Yes, this course teaches you how to "ground ship" with UPS and FedEx; however, in order to work with either company, you must complete an application and document your certification. There is not a "shipper identification number." A vehicle ID number is required on the Hazardous Materials shipping papers for the transporter. We do not currently offer this service. You will need to contact an emergency response telephone contractor or your OEM to receive this service. 9. What is the Cost of Hazmat U Online Training? A 1 year subscription for Hazmat U Online training is $299 making this training available to all employees of the purchasing location for less than $1 per day. 11. If I Complete Surface Transportation training, am I able to ship by Air or Sea? No, to be able to ship hazardous goods by air or sea, you must complete the Multi Modal (i.e. Sea & Air) Transportation of Automotive Hazardous Goods course. The Coordinating Committee For Automotive Repair (CCAR ® ), is a not-for-profit organization and the acknowledged North American leader for Environmental, Hazardous Material, and Safety training and resources for the automotive repair industry. CCAR ® has provided online training to more than 6,860 automotive related businesses and 1,900 schools in all 50 U.S. states, the Bahamas, and Canada. More than 11 million training tests have been taken by various industry segments, including schools and universities. 2. What is CCAR's Mission? 3.Who Else is Using AutoEHS? CCAR partnered with ShipMate, Inc. to offer AutoEHS training to the automotive industry. Since 2004, over 11 million training tests have been completed representing more than 500,000 users, of which almost 400,000 are school users – all of which have used CCAR courses for their safety training needs. 4. Who Else is Using HazmatU? Working together, CCAR®/ShipMate™ have created an automotive dealer training program that meets the DOT requirements for receiving, preparing, offering or transporting hazardous materials domestically by ground. The program was officially launched at the NAAHAC Symposium on Sept. 29th , 2005. Chrysler LLC - MOPAR Parts Division, General Motors Corporation, Honda of America Manufacturing, Inc., Hyundai Motor America, Kia Motors America, Inc., Mercedes-Benz USA, Mitsubishi Motor Sales America, Nissan North America, Inc., and Toyota Motor Sales. 5. What Other Programs Does CCAR Have? CCAR- Green Link ® -the National Automotive Environmental Compliance Assistance Center , operated by CCAR ® in cooperation with the U.S. Environmental Protection Agency Office of Enforcement and Compliance Assurance (OECA). We help businesses and persons engaged in automotive service, collision repair, parts and other sectors of the automotive industry to better understand their environmental responsibilities and achieve compliance with environmental program requirements. Environmental Assistance Network (EAN) - assists with the environmental initiative of Toyota Motor Sales, U.S.A., Inc. CCAR ® partners with Toyota to coordinate the EAN website and newsletter, which reach more than 1,400 Toyota and Lexus dealers around the U.S.
OSHA Alliance - The Coordinating Committee for Automotive Repair (CCAR ® ) formalized an Alliance with Occupational Safety and Health Administration (OSHA) to address worker safety and health issues in 2004. The Alliance not only highlights workplace vehicle safety, but also focuses on abrasive wheel machinery (including associated silica hazards), and ergonomics. 6. How Current is CCAR's environmental and safety information? CCAR has staff who carefully watch federal laws on a regular basis and have contact with all 50 states. The information on our site changes almost daily as laws and information change. 7. How do I Contact a Representative for More Information?